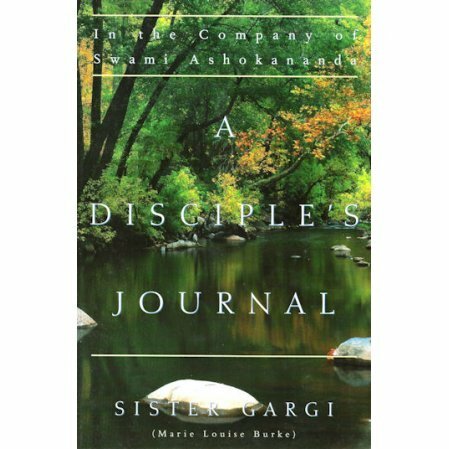 A DISCIPLE'S JOURNAL is Sister Gargi's personal story of her spiritual training over two decades by Swami Ashokananda (1893-1969), the head of the Vedanta Society of Northern California. This is an intense book and is not meant for people new to the spiritual path. As with any of our books, we remind our readers that the teachings in this book may not apply to you. They were given to one person at a certain time for a particular reason. That said, this is a book filled with renunciation that may shake your inner foundation. The swami doesn't waste time with the distractions of ordinary life. For him, God is real and everywhere and waiting for us to reach out, but we have to change our priorities. The swami makes the amazing statement that we suffer because we want to. We are distracted with the pleasures of life because we want to be. Her journal begins in 1950 when the Swami started to teach her meditation in the Hindu tradition of Vedanta. Marie Louise Burke, as she was then known, went on to become a prominent literary figure in the Vedanta movement and later a respected monastic.Later known as Sister Gargi, she shares the riches of her long and fruitful spiritual quest. She also shares her struggles with self-doubt, writer's block, and divorce, along with the low points of her spiritual journey. Readers can eavesdrop on spontaneous moments of spiritual instruction, during which the author is lifted from a state of uncertainty into a confident possession of her own being. This journal gives the reader intimate glimpses of her inner development through the loving insights and scoldings of an authentic spiritual guide. A drama unfolds between teacher and disciple that is more poignant than fiction. "You people should not worry. Sri Ramakrishna can push the cripple across a mountain. The explosive power of Sri Ramakrishna is behind you. He turns everything to good use, even your mistakes." "Worldly people deplete themselves until they become like dry fibers. They run around filling in their lives with this and that -- art, music, entertainment, social life -- so that in the end there is no energy left. they spend their whole lives filling in time. (But) in spiritual life one grows quieter and tastes real joy. One learns to be quiet. The mind grow still and one finds real happiness... the whole world becomes joyous, filled with sweetness and festivity. Wherever one goes it is festive, dripping with honey. One sees everything that way."